Soup is easily one of my favourite dinners or lunches. So warming and comforting. And so easy to make ahead! One soup I have always loved was Creamy Tomato Soup. I used to buy those packets of soup and have them at school and then later work with a sandwich for a quick lunch. But looking back the ingredients possibly weren’t that natural! But this Creamy Tomato Soup is all natural. It’s vegan, yet super smooth and creamy. And did I mention delicious? It is oh so delicious. And my personal favourite. I have been basking in the feedback in my Pumpkin Soup. Lots of kids are enjoying bowlful after bowlful of delicious, nutritious and comforting soup much to their parent’s delight. And that makes me so happy! And from my discussions with you, I know that a lot of parents don’t serve soups to their kiddos. I get it. Soup is messy. It’s hot. And no-one wants to burn their children in the process of feeding them. But let me give you some help! 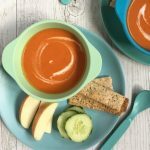 I have some tips for offering soup to children so that this easy and nutritious meal can be offered to your children. Make sure the soup is cool enough to eat. Check the temperature before serving. I recommend making cooler than normal for young children who may spill it on themselves. This is one food you really do not want to serve to children steaming hot! Start them young. My kiddos were eating soup from a really young age. I was gifted amazing silicone bibs that have a food catcher that catches the drips and makes serving soup a breeze. Try serving the soup in a cup instead of a bowl. Dippers are your friend, try serving soup with toast, english muffins, buns or bread rolls, grilled cheese, Gozleme or even veggie dippers. Add toppings to add some interest or crunch – pasta, croutons, cheese,bacon (mmmm bacon) and roasted nuts all make great toppings. 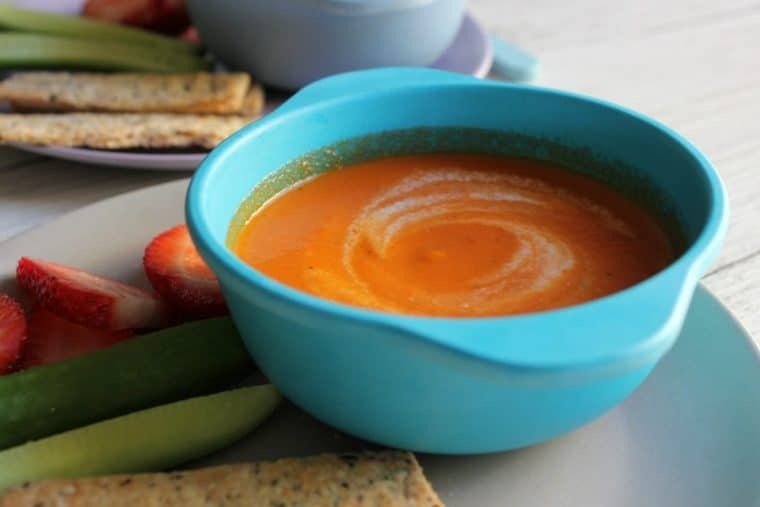 Try different flavours – my kids favourites include pumpkin, tomato, broccoli & cheese soup and chicken noodle soup. Try serving soup for lunches or dinners and even try serving it as an entree or side dish with other food so there is no pressure at all to eat it. The great thing about this nourishing Creamy Tomato Soup and, really, most soups is that they’re generally very nutrient dense and I love how many vegetables you can pack into them. So I think soups are a great option for school lunches. 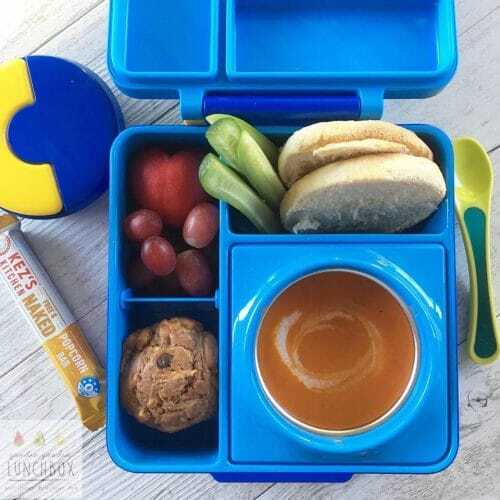 If you are looking for more ideas to get vegetables in the lunchbox check out this blog post. We were gifted an Omiebox that we love and is fantastic for taking hot foods like this Creamy Tomato Soup to school. But food jars and thermoses are great too. Now full disclosure, two of my three my kids are still learning to like this soup. They adore my Pumpkin Soup but there is a slight acidity to this soup that I think is challenging my kiddos taste buds. My daughter likes this soup though, as do my husband and I, so I will keep offering this soup to them so that they have a chance to learn to like it. But I don’t want my kids to feel pressured to eat the soup. Nor do I want to worry they have not eaten enough. So when I am serving this soup I offer it with other vegetables, fruits and bread. I also add some cooked pasta as I serve it to try and entice my carb-loving kids. This way I have reduced the pressure and worry and it makes for happy meal times. Add the basil and tomato paste and mix through until well combined, stirring for around a minute ensuring the mix does not catch. I hope you enjoy this recipe and that you find the tips for offering soup to children helpful. I love to hear and engage with you so feel free to pop over to Instagram and follow along with lots of food and lunchbox inspiration or I am over on Facebook so pop over and say hi! Delicious. I didn’t have the tomato paste but it turned out fine. Added some small cooked pasta shells at the end before serving. First go on tomato soup for Mr 19mths, had a few spoonfuls – good start. I’ll keep trying 😄 thanks Bernadette for all the inspiring and useful food ideas info on your website and Instagram!